Lovely remodeled Beachfront duplex with new floors, carpet, counters, appliances, furniture, etc. Take in the incredible views of the waves and miles of beach from your living/dining “great room” design. This property features incredible views with over 25 feet of windows on the north side facing Cascade Head. Bring the family, this beautiful rental sleeps up to 6 and is in a great location with on-site beach access and in walking distance to restaurants and Chinook Winds Casino. We had a great time, this is the second time we have stayed. Beautiful place. Well maintained. It is small but a great use of space so it feels open. Great place to take your family and the beach is right there. Beds and blankets where comfortable, everything I needed to cook dinner was there. Loved the hot tub on the deck. I sat in the hot tub and watched my kids and husband play on the beach while my baby slept. Clean, quiet, and comfortable! A hot tub that was actually HOT! Fabulous view. Blue Pacific was easy to work with and very responsive to questions. The rental process was easy and the check-in/check-out process was very simple and well documented in case you forgot or needed information on how to do/use something. Our family vacation was fantastic. 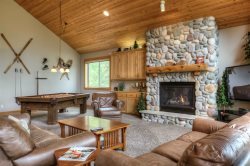 We loved the location of the property and it had all the amenities you'd need for an easy and fun vacation. The hottub was a definite high point and it was wonderful to be able to walk just around the side of the building to access the spacious beach. Our entire family (2 adults and 3 kids - 5/7/9) were completely happy with our stay. This little condo was perfect for our family of 4. We were able to go to the beach whenever we wanted. It was very clean and close to everything. Kids enjoyed the hot tub and mom and dad enjoyed the view. Beds we're very comfortable. This house was awesome. Small and quaint with no mildewed smell. Loved our stay. The condo and location were perfect. The overall experience was good. The outside was not really what we were expecting but the inside was much better. The views were great, as well as the hot tub. The kitchen and bathroom were nice as well. Beautiful condo close to Portland. Right on the beach, view the sunset in a hot tub and enjoy the Oregon Coast.